A more compact and lightweight design than its predecessor, Speedlite 430EX III-RT is a compact and powerful external flash with radio wireless flash control are the best option for amateurs. With a maximum Guide No. 43 (meter; ISO 100; 105mm), the Speedlite 430EX III-RT covers 24mm to 105mm focal length. It supports radio transmission wireless flash “Master” and “Slave” functions to make multiple flash photography more convenient. It has an improved dot-matrix LCD with rich information display and a “Select Dial”. It also comes with a new “Color Filter SCF-E2” and “Bounce Adapter SBA-E2 to make flash photography more flexible. 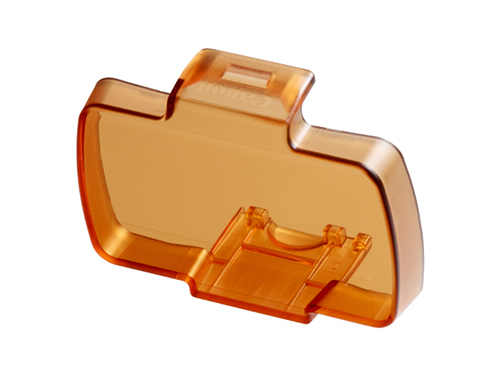 - Flash coverage from 24mm to 105mm, coverage extended to 14mm with built-in wide panel. - Improved operability by introducing dot-matrix LCD with rich information display and “Select Dial”. - Achieve a more compact and lightweight design than predecessor by reducing the size of flash head with improved zoom optics, the use of main capacitor with smaller size and new internal construction. Combining high-end flash performance in an easy-to-carry compact design, Speedlite 430EX III-RT brings effective flash photography to meet various needs in different situations. It has a maximum Guide No. 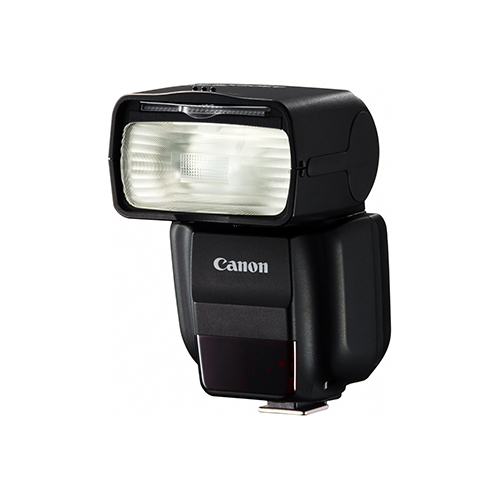 of 43 (meter; ISO 100; 105mm) and supports E-TTL II/E-TTL autoflash*1 and Manual flash. Flash coverage is from 24mm to 105mm (supports 14mm with wide panel) and autozoom control is supported to automatically adjust the flash coverage depending on the image sensor size. The “Light Distribution” function inherited from the flagship Speedlite 600EX-RT allows 2 settings for flash coverage, either as “Guide Number Priority” for better telephoto flash or “Even Coverage” for more even light distribution across the whole frame. 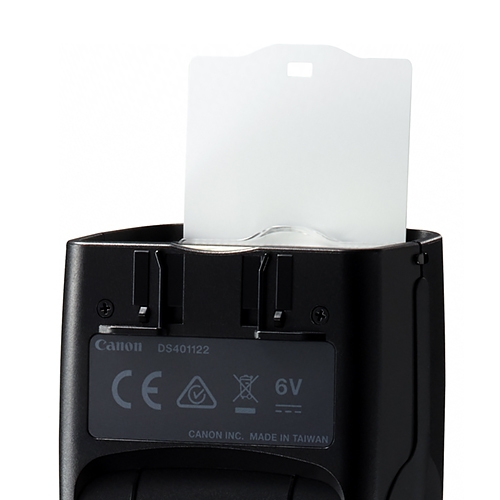 With rapid and silent recycling and a new “Quick Flash Function”, a high degree of continuous shooting responsiveness is assured. It also features an overheat protection to better prevent damage to the flash head, allowing photographers to utilize the flash’s capability to its fullest in a well controlled manner. Speedlite 430EX III-RT supports bounce flash with bounce angle 90° up, 150° left and 180° right for more refined control on flash head angle to achieve the desired and natural lighting results. By attaching the “Bounce Adapter SBA-E2” that comes with the flash, the bounce flash can be spread across a larger area and shadows on the front surface of the subject can be further suppressed, bringing an even more natural bounce effect. In addition, a new built-in “Catchlight Panel” can be used to add a sparkle of light in the eyes to bring portraits to life. When shooting in tungsten light environment, the included orange “Color Filter SCF-E2” can be attached to optimize color temperature, and with the White Balance automatically adjusted and transmission of color temperature information, more superior flash performance can be assured. Being the second model in the Speedlite family that integrates radio transmission wireless flash “Master” and “Slave” functions*2, first introduced in the flagship Speedlite 600EX-RT, Speedlite 430EX III-RT can work alongside Speedlite 600EX-RT’s wireless flash system and enable users to experiment with more off-camera lighting setups. 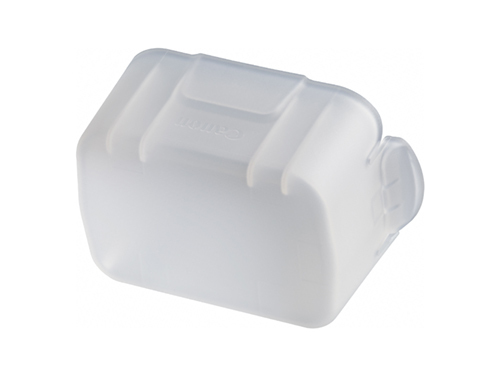 Communicating on 2.4GHz frequencies, Speedlite 430EX III-RT does not have the same directional limitations of traditional wireless optical transmitters, and is free from interruption due to reception angles or physical obstacles. 15 transmission channels are available and 10,000 radio transmission IDs can be set to prevent misfiring in the event of signal interference on the same channel, guaranteeing stable and reliable wireless flash performance. It facilitates radio transmission up to 30m, among up to 5 groups*4 with a total of 15 individual slave units for greater flexibility in creating fabulous lighting effects with multiple wireless flash setup. 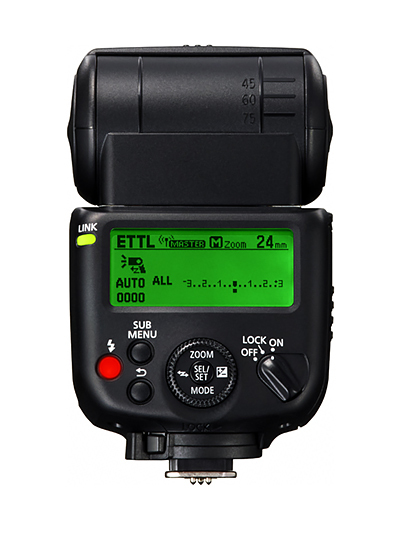 It also supports bi-directional communication between master and slave units for enhanced operational flexibility, enabling remote release*3 of the master camera's shutter with any slave unit from diverse angles, and with the Linked Shooting*3 up to 15 EOS cameras can be released simultaneously to capture the decisive moment from various angles. 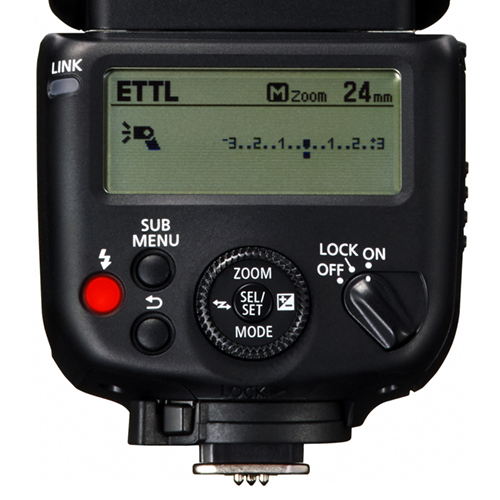 In addition to radio transmission, Speedlite 430EXIII-RT also supports optical transmission wireless flash “Slave” function*5. For cameras that feature an Integrated Speedlite Transmitter such as EOS 70D and EOS 760D, Speedlite 430EX III-RT can be used instantly as an off-camera flash with various flash settings such as output and power controllable from the camera’s menu*6. Speedlite 430EX III-RT achieves a more compact and lightweight design than its predecessor by reducing the size of flash head with improved zoom optics, the use of a smaller main capacitor and new internal construction that optimizes the placement of AF-assist beam and wireless antenna systems. Weighing only 295g, it is easy to carry around and further reduces the burden when shooting outdoor. In addition, Speedlite 430EX III-RT is equipped with a dot-matrix LCD panel for easier viewing and rich information display, and it makes operation simpler with the new graphic user interface. The newly introduced “Select Dial” which integrates the functions of “cross key” and “Select/Set” button makes change of frequently used settings, such as flash exposure compensation, much faster. Speedlite 430EX III-RT also offers 10 custom functions and 8 personal functions for more personalized flash operation according to individual preference. 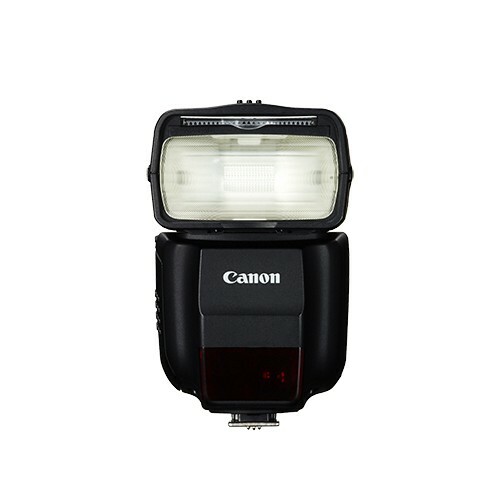 Flash settings can also be easily controlled through the menu of compatible EOS cameras*6. *2 Compatible with Speedlite 600EX II-RT, 600EX-RT, 430EX III-RT and Speedlite Transmitter ST-E3-RT (ST-E3-RT as “Master” Only). *3 Requires EOS DSLR cameras released from 2012 and onwards (except EOS 60Da/1300D/1200D) with Speedlite 600EX II-RT, 600EX-RT, 430EX III-RT or ST-E3-RT attached. *4 Applicable to EOS DSLR cameras released from 2012 and onwards (except EOS 60Da/1300D/1200D).